For better or worse, the Panthers’ 2019 prospects are likely to come down to the health of quarterback Cam Newton. The idea has been floated that Newton could sit out the entire season if it is decided he needs another operation, and if that’s the case the team’s real-life and fantasy prospects both plummet. Taylor Heinicke or Kyle Allen or a rookie draft pick or a veteran signee just wouldn’t offer anything like the production Newton has in his career, even if Newton himself has been frustrating and inconsistent at times. With or without that, though, there are other moves the Panthers could make to help their prospects. Christian McCaffrey established himself in 2018 as one of the league’s true bell cows, dominating snaps like few running backs have in a long time and cementing his place at or near the top of 2019 drafts. D.J. Moore and Curtis Samuel both outshone impending free agent Devin Funchess, while Ian Thomas filled in capably for an injured Greg Olsen. With both Moore, Samuel, and both tight ends back for 2019, the Panthers’ pass-catching situation is actually better than it has been in some time. But there are moves we’d like to see the team make from a fantasy perspective heading into next season that would at least help paper over some of the Newton worries. As mentioned in the overall offseason wish list piece, Panthers could frustrate every fantasy owner and sign Mark Ingram or Tevin Coleman or some other back who would really warrant more playing time and cut into McCaffrey’s ceiling. But from a fantasy perspective, a signing like Yeldon — a backup who could start and get plenty of work in a pinch but won’t necessarily need it — would be far more interesting. 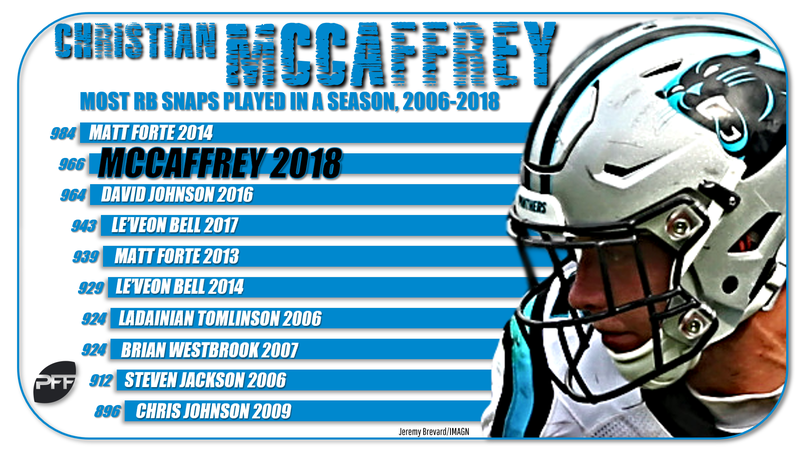 McCaffrey’s insane snap load in 2018 was ridiculously fun, but it’s also terrifying, because the more a back plays, the more he has opportunities to get hurt, and nobody played more than McCaffrey. Yeldon could be a fantasy handcuff for owners who opt for such a strategy or a waiver-wire lottery ticket if not. Either way, he’d be a far more interesting backup than C.J. Anderson/Cameron Artis-Payne/etc., with a marginally similar (if worse) playing style to McCaffrey. For as productive as Moore and Samuel were in spurts in 2018, the Panthers lacked a deep target. Torrey Smith managed all of 17 receptions across 11 games, while went from averaging 7.0 targets a game through Week 7 to 3.8 after that and certainly won’t be back in 2019. This year’s free agent class isn’t going to blow anyone away, and the Panthers are in the bottom tier around the league in available cap space, but Williams could still be an interesting signing. He’s a boom-or-bust player, with four games of double-digit fantasy points in 2018 but six of under 5.0, but he does offer an average depth of target similar to Funchess’ (in fact, they were back-to-back in the 2018 aDOT rankings, separated by 0.02 yards). Moore and Samuel are both more suited to underneath roles, but Williams could help Newton (or whoever the quarterback is) stretch the field more, opening up things for the Panthers’ multitude of short-target options. Officially, Flacco isn’t even a free agent yet, but c’mon, it’s coming. With the possibility Newton misses some, most, or all of the season, the Panthers have a roster that could still be a reasonable fringe contender with a competent quarterback. Kick the tires on Teddy Bridgewater, and maybe consider Tyrod Taylor, but Flacco is probably the best mix of available and affordable for Carolina. Especially if the team can get a field-stretcher like Williams, Flacco would be an intriguing lower-tier quarterback.